The village is built in a circle around an 11th century building. Damaged on several occasions, it has been rebuilt a number of times. 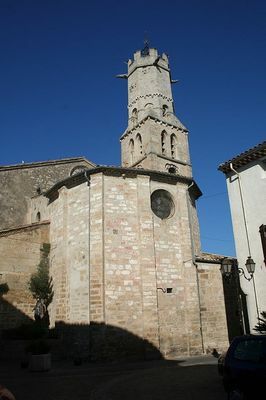 Its most remarkable feature is its exceptionally slender bell tower, whose lower section dates from the 10th and 11th centuries. Two octagonal floors were later added in the 12th century, which were subsequently finished off with crenels and gargoyles in the 16th century. Inside there are some interesting furnishings: baptismal fonts, a holy table in forged iron and marble, an organ, a red marble font and paintings from the 17th and 18th centuries. There is no review about Eglise Saint Etienne De Villeneuve, be the first to leave one !